» Dan Aykroyd’s Cameo In ‘Ghostbusters’ Reboot! Dan Aykroyd’s Cameo In ‘Ghostbusters’ Reboot! An old face on a new set. Dan Aykroyd, one of the original four Ghostbusters, has a cameo in Paul Feig’s reboot. But the new version is a hard reboot, meaning it takes place in a universe where the events of the original films never took place, so the question in many people’s minds has been what Aykroyd’s role was. Now, Indie Revolver is reporting that they have the answer. I’ve seen a few negative reactions to this news, but honestly I don’t think it says much about the movie either way. It kind of sounds like a throwaway joke – it doesn’t necessarily mean that all the jokes will rely on nostalgic references. The Ghostbusters reboot stars Melissa McCarthy, Kristen Wiig, Leslie Jones, and Kate McKinnon. Joining them in the cast are Chris Hemsworth, Andy Garcia (Ocean’s Eleven), Michael Kenneth Williams (The Wire), Matt Walsh (Veep), and Pat Kiernan. Paul Feig is directing from a script by Kate Dippold. The film is scheduled for release on July 22, 2016. ‘Nosferatu’ Director F.W. Murnau’s Head Stolen!? 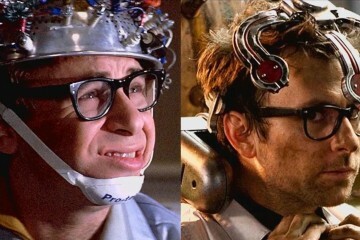 Will Rick Moranis Make a Cameo in the ‘Ghostbusters’ Reboot?